A trip to a 500 year old stone cutting town in Germany to design your very own one of a kind locket- sounds like what would happen in one jewelry lover’s wildest dreams. This past year, we were able to make this dream a reality with Neiman Marcus to create this one of a kind experience as one of their Fantasy Gifts last year. Take a peek into the luxurious itinerary our fantasy gift customer's experience... A three day trip to Germany to design a one of a kind locket with Monica Rich Kosann. She arrived in the German historic town of Idar Oberstein, home to some of the world’s finest gemstone cutters, to begin her journey towards creating a timeless heirloom. 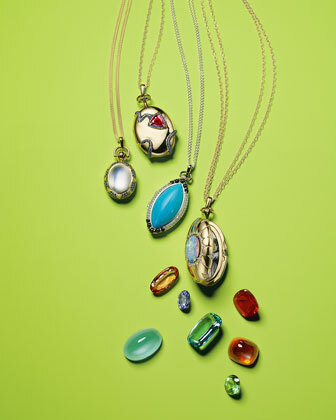 She met with Monica at one of the oldest family gem workshops (in business since 1847) of Constantin Wild, on a quest to find and design the perfect locket. Constantin took her on a tour of his workshop and gave an introduction to gem cutting and polishing. Rough stones waiting to be cut. Afterwards, she had a chance to be creative and embrace her inner designer! Monica presented her one of a kind locket concepts. This is where and when she picked which one of a kind stone she wanted for her locket - a pink cuprian tourmaline stone. Then she toured the Gem Museum with Museum Director Mrs. Anette Fuhr and Constantin Wild, which made for a unique and personal experience before heading back to the hotel for dinner. The next day she was back to Constantin Wild’s show room for the final review and selection of sketches and stones with Monica & Constantin. Afterwards they grabbed lunch and headed to a Vineyard tasting at Emrich Schonleber. Emrich Schonleber is a family owned, award winning company that dates back to the mid 18th century. It goes without saying that they definitely enjoyed a few glasses a wine produced by this amazing vineyard that afternoon! To top off the trip, they ended at Stromburg Le Val d'Or for dinner, an old castle that would make anyone feel like they’re in a fantasy. The final product was a beautiful 18K White Gold One of a Kind Locket with a center oval faceted pink cuprian tourmaline stone. She chose purple spinel accents in a blackened setting and black diamonds on the bail….can you say perfection? This locket will help tell her story which this unique Germany trip will now be a part of.